Many people would like to know solutions on how to upload a document to Kindle device, especially those people who have switched from Kobo or Adobe Digital Editions since they may want to transfer their eBooks purchased from Kobo and Adobe to Kindle device. Amazon has not provided any official way for such cases. However, with 3rd-party tools, you could easily transfer non-Amazon documents to Kindle devices. In this guide, we would like to introduce you several effective solutions on how to upload local document to Kindle device, eBooks from Kobo and Adobe Digital Edition included. But before you start to upload a document to Kindle device, you need to know that Kindle accepts documents in the below formats: Kindle Format (.MOBI, .AZW), Microsoft Word (.DOC, .DOCX), HTML (.HTML, .HTM), RTF (.RTF), Text (.TXT), JPEG (.JPEG, .JPG), GIF (.GIF), PNG (.PNG), BMP (.BMP), PDF (.PDF). If you have documents on your computer that you need them to be on your Kindle Paperwhite, or you want to transfer documents from one Kindle device to another, you can transfer these documents to Kindle with ease via USB cable. 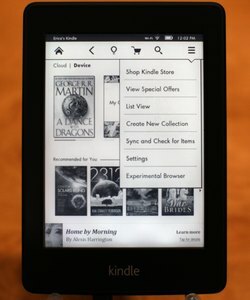 Connecting your Kindle via USB cable and transferring books to Kindle device via drag-and-drop is simple, and feasible for both Macintosh and Windows users. You could easily download and transfer Kindle content and personal documents to Kindle devices through USB connection. 1. Connect your Kindle device to computer via USB cable. 2. On Amazon website, log in with your own account. Click the “Your Account” drop-down menu and select the “Manage Your Content and Devices” option. 3. Check the documents you want to transfer to another Kindle device and then click the “Actions” button to select “Download and Transfer via USB”. 4. Select the Kindle device you want to transfer Kindle documents to as target path. If your Kindle device couldn’t be set as target drive, just download your Kindle files to local drive and then copy and paste the downloaded Kindle devices to target Kindle device. 1. Connect your Kindle device with computer via provided USB cable. Make sure your Kindle device has been successfully connected to computer. 2. Enter Desktop mode and open “File Explorer” to find your Kindle under “Devices and Drives”. Open your Kindle device folder and then open its “Documents” folder. 3. Navigate to the folder that has saved your documents, then copy and paste documents to the “Documents” folder inside your Kindle device folder. 4. Right-click the “Safely Remove Devices and Hardware” icon in the notification area of your computer. Select the “Eject” option to plug out of Kindle device from computer. With USB cable connection, you could easily upload document to Kindle devices, though the process differs according to Kindle editions. Besides using USB cable connection to transfer and upload documents to Kindle devices, you could also upload document to Kindle device via email. You could set your contacts as approved Kindle contacts, and then you and the approved contacts could send documents to your registered Kindle devices, free Kindle reading apps, and your Kindle Library in the Amazon Cloud via your Send-to-Kindle email address (name@kindle.com). This Send-to-Kindle email address is a unique address. 1. Log into Amazon website with your account to find out your Send-to-Kindle email address by clicking “Manage Your Kindle > Manage Your Devices” options successively. 2. Open “Manage Your Kindle > Personal Document Settings” page then to add email account that will be allowed to send documents to you via email. You could add more accounts to this list. 3. To send a document to your Kindle device or app, simply attach it to an e-mail addressed to your Send-to-Kindle e-mail. It is extremely easy to transfer documents to Kindle devices via email, though the email account setting would be a little bit time consuming. To send documents to Kindle devices like Paperwhite, Fire, etc., you could also make use of the Send to Kindle app, which is currently available in PC, Internet browser and Android devices. Send to Kindle app is much more recommended since its wide availability and on-the-fly converting feature, which will convert some file formats like Word to let them readable on Kindle devices. 1. 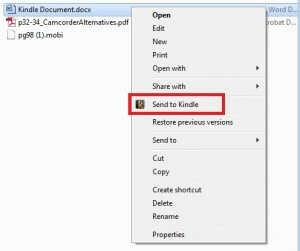 Download and install Send to Kindle app on your PC, and then log in with your Kindle account. 2. Find the document you want to send or upload to Kindle device. 3. Right click it and then choose “Send to Kindle” option. 4. On the popup window, you could edit the title and author information. Check the target Kindle device in the “Deliver to” box. Then click the “Send” button. Once you click send, the document will be sent to your Kindle via Wi-Fi. This app is extremely easy to use. The above 3 methods all help you transfer Kindle documents between different Kindle devices, and upload local documents to Kindle devices effectively. However, they don’t work with eBooks from other eBook readers like Kobo and Adobe Digital Edition. What should you do if you want to transfer eBooks from Kobo or Adobe Digital Edition to Kindle devices? We all know that eBooks from Kobo and Adobe have been DRM protected. Therefore, to transfer eBook documents from Kobo and Adobe Digital Edition to Kindle, you need to firstly remove the DRM protection and then convert these documents to be Kindle accepted file formats. In such case, you will need Leawo Prof. DRM, a professional DRM removal and converter tool for Kindle, Kobo, and Adobe Digital Edition eBook documents. 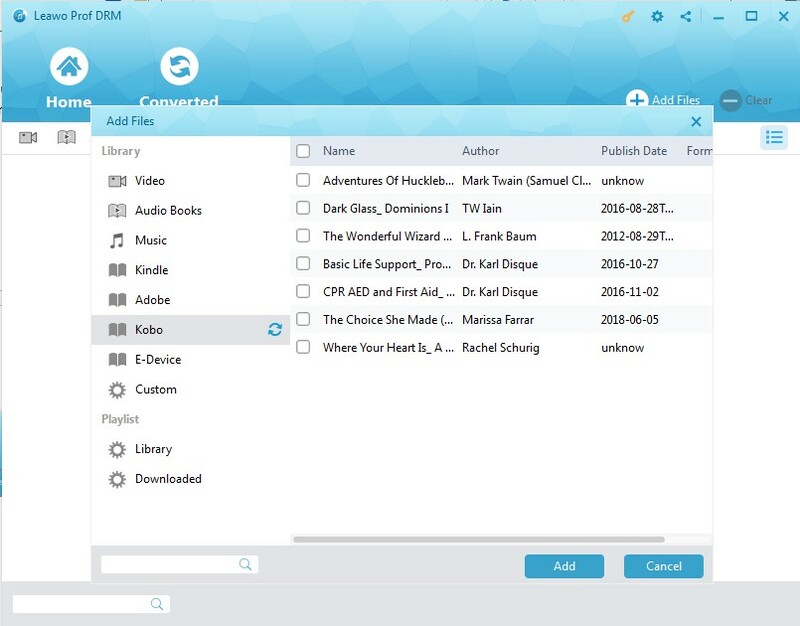 Leawo Prof. DRM includes Kindle eBook converter, Kobo eBook converter and Adobe Digital Edition eBook converter. It could remove DRM protection from these eBooks and then convert these eBooks to DRM-free Mobi, TXT, ePub or AZW3 eBook files for diverse eBook readers. The below content would take converting Kobo eBooks for example to show you how to send Kobo eBooks to Kindle devices. For sending Adobe Digital Edition eBooks to Kindle, please click how to convert Adobe Digital Edition eBooks. Launch Leawo Prof. DRM, and then click the “Add Files” button. On the following popup “Add Files” window, open “Library > Kobo” tab consecutively. Choose the eBooks you want to send to Kindle device and then click the “Add” button. As mentioned above, Leawo Prof. DRM could help you convert Kobo eBooks to DRM-free ePub, TXT, Mobi and AZW3 files. After loading source Kobo eBooks, click the pencil “Edit” icon to choose Mobi as output format from these 4 formats since Kindle devices accept Mobi eBooks. Then choose to “Apply to current file only” or “Apply to All eBook Files” as you like. Then, after setting output format, move mouse to the bottom and then open the “Output” box to set output directory to save the final converted Kobo eBook files. Finally, click the bottom right “Convert” button to start removing DRM protection from Kobo eBooks and converting Kobo eBooks for sending to Kindle devices. The DRM removal happens in the background. You could view the whole converting process. After converting, you could then navigate to the converted Kobo eBooks folder, and then you could upload the converted eBooks to Kindle devices in the ways mentioned above. Leawo Prof. DRM is far more than an eBook DRM removal and converter. It’s also an iTunes DRM removal converter that could convert iTunes DRM video to DRM-free MP4 files, convert iTunes DRM music to DRM-free MP3 files, convert iTunes/Audible DRM audiobooks to DRM-free MP3 files, and download and convert Spotify songs. It’s a comprehensive DRM removal and converter suite, which is not easy to get in the market. All the above solutions help you easily transfer Kindle documents between Kindle devices, upload local documents to Kindle devices, and even transfer eBooks from Kobo and Adobe Digital Edition to Kindle devices. You get the most comprehensive solutions here.